“Football is a simple game; 22 men chase a ball for 90 minutes.” – Gary Lineker, England football legend. That’s true, but not entirely. For one, A Division matches are played for a reduced 80 minutes. But there is more. Imagine playing at the Jalan Besar Stadium with hordes of friends and schoolmates cheering you on. Imagine embarking on a jinking run, beating one, two, three players before unleashing an unstoppable shot into the goal. With its fair share of thrills and spills it brings with it the ecstasy of winning which may suddenly turn into the heartbreak of losing and the regret which long remains etched in the memory. But above all, Lineker is right: football is a team sport in which 22 men chase after a ball – not alone, but together, as a team. Here at Raffles Football, there is no space for the individualists, the show boaters and crowd pleasers. It is team above self. Though our team is filled with unique members with differing views and backgrounds, we press on and look to iron out the differences. It’s truly “one for all and all for one”. Coached by one of the best youth coaches in Singapore, RI Football has traditionally taken its place amongst the ‘Big Four’ of JC football. After an unfortunate blip last season, the passion to play and desire to bring the trophy home is as strong as ever. “Width and depth support, mobility, penetration, creativity,” replies coach Philippe Aw, when asked what the team aspires towards. Drills, passing, shooting and runs are all part of the rigorous training sessions designed to build technique and physical fitness. The team frequently meets up for extra “self-training” sessions to do runs, work out in the gym or simply kick a ball around together. We have also braved the rigorous six-day training week during season, when we had to juggle football and school work as well as the taxing physical trainings – climbing 24×3 stories with barely a break in between sets. Apart from training sessions, playing tchoukball, watching movies and going out to binge eat are all activities through which the team comes together to relax and bond. Members can look forward to playing matches on a frequent basis, with friendly games with other schools and clubs planned out for game time and experience. 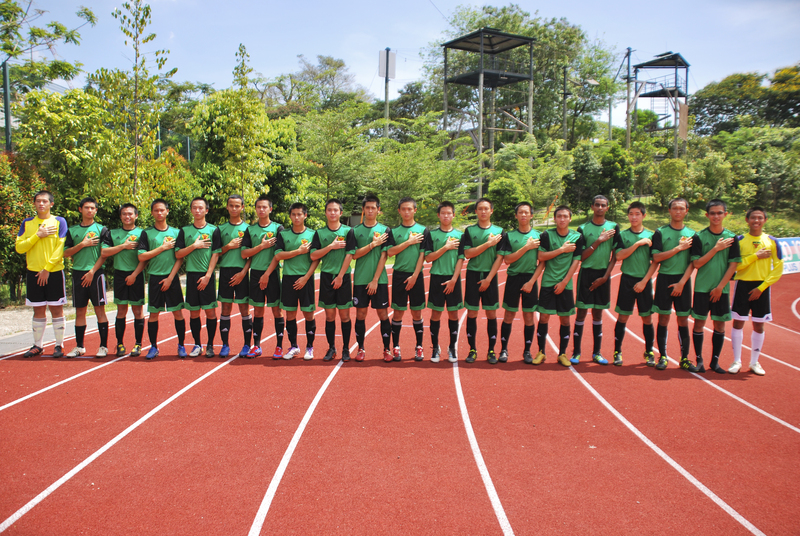 These games lead up to the A Division Football Competition in which JCs compete for the coveted national title. In addition to games and training, Raffles Football also plans CIP events to teach less fortunate kids basic soccer skills.